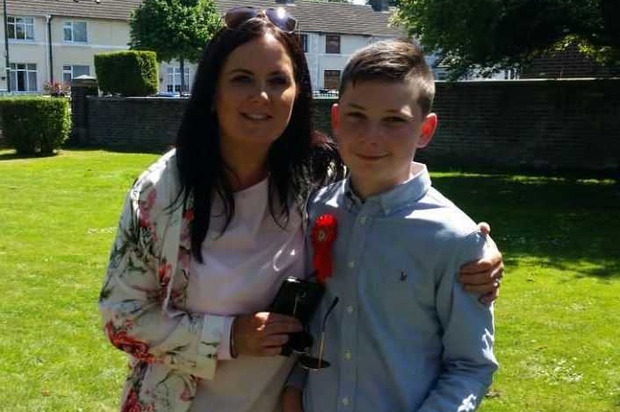 A mum fears her 12-year-old son who has autism will regress due to the fact that she can't place him in a secondary school anywhere in Dublin or Kildare. Jack Cullen is due to start second level this September and needs to attend a school with am ASD unit or a class for children with special needs. His mum, Karen Kavanagh, began searching for schools in September 2015 when she was given a list of 11 schools by the HSE. These were schools in Dublin and Kildare that were able to meet his needs. However due to the schools being at capacity she has not been able to secure a place. If there is no place found a home-tutor will be provided. Jack has autism and is also severely dyslexic but has been in a special education setting since his mum sought early intervention for him after his diagnosis. He just graduated from primary school in Drimnagh. There is no school with an ASD unit in Tallaght where the family live but there is no availability anywhere in the capital or in Co Kildare. "He's very outgoing now, he has two good friends, he has his independence, he travels back and forth to school. All of that is going to be taken away from him," she said. "I think he'll regress if he is taught at home. It will take away everything I've fought for for Jack. When he was diagnosed I was told social skills were one of the main factors in autism and by keeping him at home they are contradicting themselves. "If he doesn't get a school it will undo all of the good work he has done and the school have done for him," she added. "He'll be isolated and there are too many distractions at home." The worried mum said the uncertainty around his schooling situation is having a negative effect on her own mental health. "I'm stressed, I'm not sleeping, I'm anxious and I'm full of anger to be honest. I feel like I'm knocking on every door and not getting any answers," she said. However, she is more concerned about the negative effect the delay will have on her son if he does manage to secure a place as he will have lost out on a valuable period of transition. "He should be going through the transition now, routine and structure is so important when you have a child with autism. He needs to be getting used to the building and the bus routes, everything," she said. A home tutor will not meet her son's needs and will be tantamount to a violation of his fundamental rights Ms Kavanagh said. "He is entitled to an education and a school like every other child." The mum-of-two has contacted Tusla and the Minister for Education, Richard Bruton directly. A Department of Education spokesperson said they cannot comment on individual cases, but advised that parents of students with special educational needs who are experiencing difficulties in locating a school placement "are supported through their local Special Educational Needs Organiser (SENO) and local Educational Welfare Officer (EWO)". "The Department is working with the NCSE and the relevant education partners to ensure that a placement will be available for all students for the forthcoming school year," they said. "Under Section 29 of the Education Act, a parent or guardian can make an appeal to the Department of Education and Skills in respect of a decision by a board of management or a person acting on behalf of a board of management to: Refuse to enrol a student in the school;Permanently exclude a student from the school; or Suspend a student from the school for a cumulative period of 20 schools days in any one school year. "The appeals process is currently underway. "While this process is ongoing or where there is no placement available, the Department’s Home Tuition Grant Schemes can provide funding towards home tuition as an interim measure until a placement becomes available. "It is intended to include a provision in the Education (Admission to Schools) Bill at Report Stage that will provide for, based on reports and advice from the NCSE, Ministerial powers to require a school to open a special class or increase the number of special classes in schools identified by the NCSE." Lynnn Byrne, a member of the Tallaght Parents Support Network, has been supporting and advocating for Karen and Jack. She faced a similar situation for her son a number of years ago. "It's a sad indictment of this country that nearly a decade later we are still here," she said.